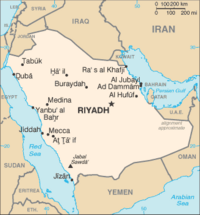 Saudi Arabia (Arabic: السعودية, as-Suʻūdiyya) or the Kingdom of Saudi Arabia (Arabic: المملكة العربية السعودية, al-Mamlaka al-ʻArabiyya as-Suʻūdiyya) is a country on the Arabian Peninsula in the Middle East, bordered by Iraq, Jordan, Kuwait, Oman, Qatar, the United Arab Emirates and Yemen. The Kingdom of Saudi Arabia was founded by King Abdulaziz Al Saud (known in the West as Ibn Saud) in 1932. He had gained control of the city of Riyadh in 1902, going on to conquer much of the Arabian peninsula in the next thirty years. All kings of Saudi Arabia after Ibn Saud's death have been his sons. Large oil reserves were discovered in Saudi Arabia in 1938. This page was last modified on 24 April 2016, at 17:53.